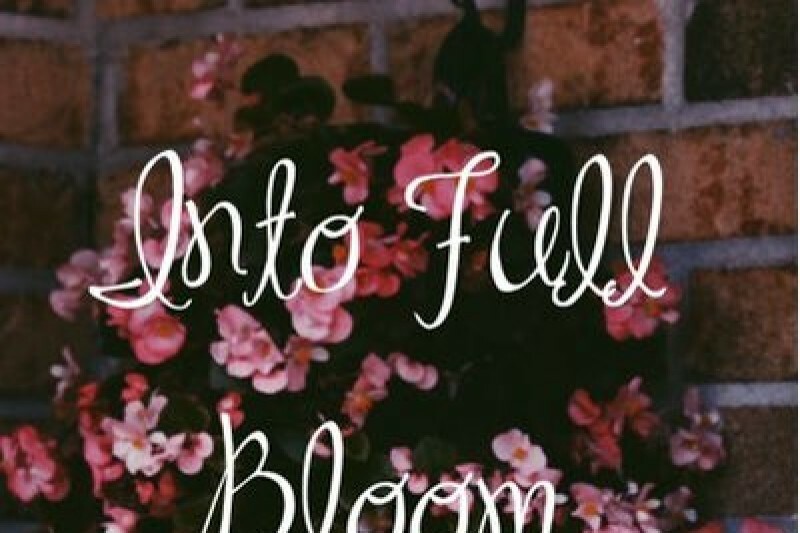 Hello all, We'd like to introduce you to Into Full Bloom. 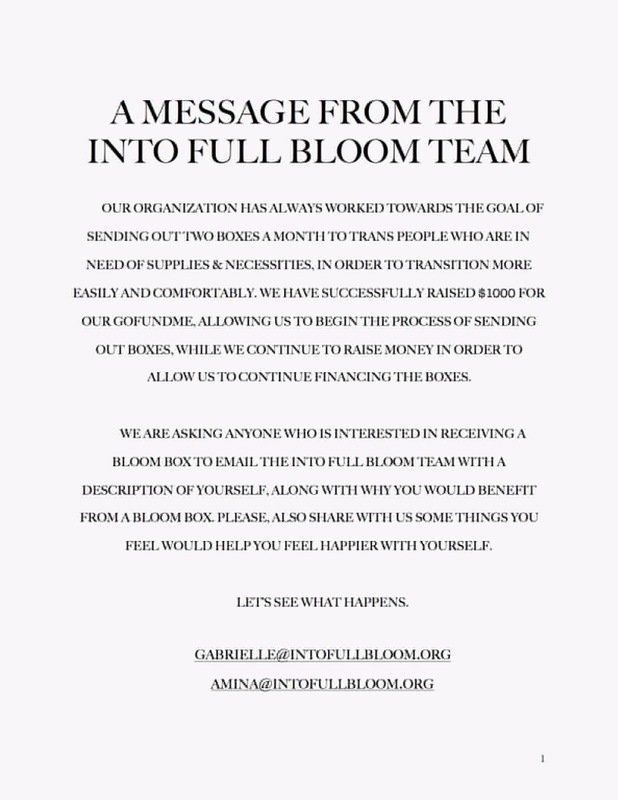 Into Full Bloom is an Organization that focuses on helping the Transgender community by supplying them with the products they could need/want for their transition. This would include Packers, Binders, Gaffs, makeup, cologne ect. Each box would contain a special message from Amina Lakin and Gabrielle Gladu explaining how to use the products and help yourself feel more comfortable with your transition. With the Budget we will be discharging these boxes for a year. This money would be used to cover shipping cost (U.S. and Canada) and the products in the boxes.. This would help all the transgender people in need for multiple reasons such as a low self esteem; lack of support or financial issues for the essentials they want to feel comfterable in there own skin. Thank you for taking your time to read and hopefully share and or donate. We have now sent out our first two Bloom Boxes with all of your support, Thank you! Hi, everyone we are so glad to announce we are sending out the first bloom boxes this month!! I cant wait to share the happy faces when they receive the bloom boxes!! Thank you all so much! Updates will be provided daily when the goal is close to being reached. That is also when we will start sending boxes and providing updates on the amazing people we plan to be helping. Omg, thank you guys so, so, sooo much for doing this!!! Just finding out about this for the very first time, made me feel beyond happy, excited, and anxious, all at once!! My name is Sean Patrick Buchanan, i am from Grosse Pointe woods Michigan. i am a 19 year old, gay and MTF Transgender person. And, being able to donate however much i can, and possibly getting one of these boxes, would mean everything to me!!! i have a extremely supportive family, and they don't care if gay or transgender, or both, or whatever. But, my parents said i can't wear makeup, or girls clothes, or wigs, etc. Because, 1.They don't have enough money for buying that sorta stuff, 2. it would make certain family members feel uncomfortable and or upset, and 3. they think i should just keep waiting until i officially move out of the house. So, hearing about people doing this sorta thing for a large group of minorities, makes me beyond happy and joyful. There's just no words to describe how i'm feeling right now, at the moment. i am just beyond grateful and glad to have people like you both to be doing a thing like this. It's just... it's just awesome, is what it is!!! :) :) ♥ ♥ From the bottom of my heart, thank you, Xoxo, Sean. Even though I'm not currently in the position to donate the amazing amounts others have, as one of the seemingly few trans-people with the support of close family, helping others feel more at home with themselves, and helping them ENJOY being who they are is important to me.